Are you an online entrepreneur or small business owner? Do you have innumerable ideas on how to make an impact through your business? Have you ever struggled with getting your ideas across through the written word? If your answer to any/all the three questions above is ‘yes’, we are a lot alike! Entrepreneurs are a unique bunch of people. Our creative brains are always on the go, giving us one idea after the other on how to make a difference in the world through our business. But the one basic ingredient we need to really grow online? Good content. All other types of online marketing (SEO, social media, emails) hinge on the content we provide. If we can write quality content that keeps readers coming back for more, it helps us build trust, traffic and traction. I’ve created a free guide with tried and true strategies to help you write better content online, even if you’re not a good writer. 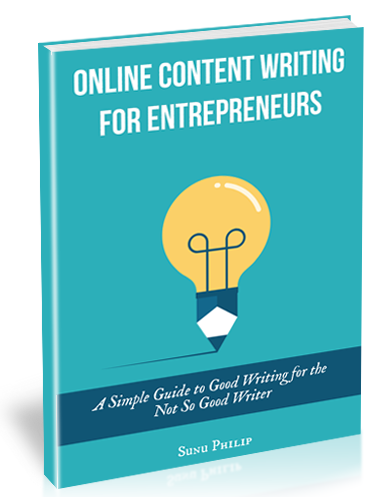 Whether you’re a blogging newbie, or an experienced entrepreneur, this eBook will help you write better content online. You don’t have to be a good writer in order to write well online. The tips in the eBook, and the tools and resources I share will equip you to keep readers enthralled with your words. This 49 page eBook is available absolutely FREE for subscribers of Clothed In Scarlet. All you need to do is sign up for my newsletter, and you’ll get complete access to the eBook. Note: This eBook is No Longer Available on this Site. Download a New Version of the FREE eBook: Content Writing 101 at Get Found Online.